Englands's connection to both islands can be traced back to the Sixteenth Century when she challenged Spain for influence and control in the New World. She was unsuccessful in hanging on to either of the islands as they passed into rival European power control for much of the next two centuries. 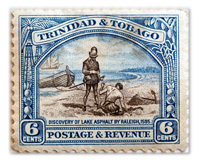 Trinidad had been discovered by Columbus on behalf of the Spanish in 1496 and Tobago in 1498. 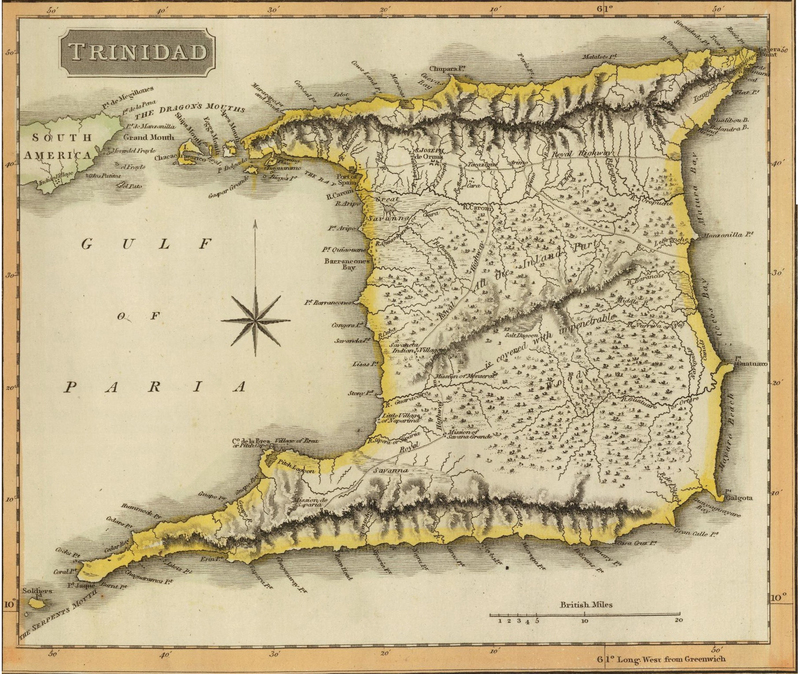 Despite their proximity, the two islands of Trinidad and Tobago had very different histories, one with a heavy Dutch and French influence and the other a Spanish influence before the British definitively took them both during the Napoleonic Wars. Even then, the British administered them separately until 1889 when they were finally merged into a single colony. England's first connection with the island of Tobago came in 1580 when sailors landed there claiming that it was uninhabited by any Europeans - meaning the Spanish. The explorer, Robert Dudley was thought to have visited the island in 1595 as part of his exploration of the West Indies and the Guiana coastline. Sir Walter Raleigh's expedition to search for El Dorado also visited the island in 1596 although it was Raleigh's Lieutenant Lawrence Keymis who actually visited the island. Once again, he confirmed that the Spanish had yet to make any settlement on the island. 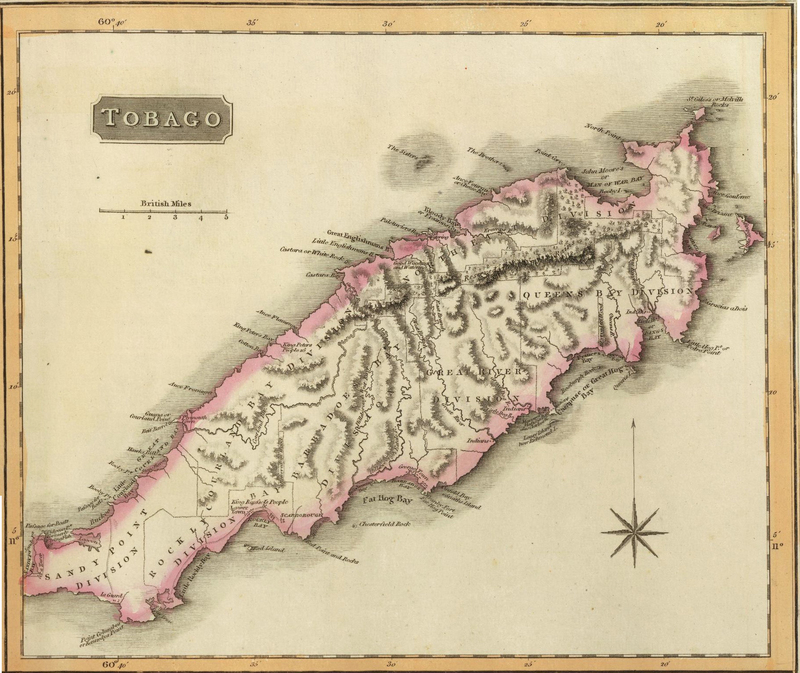 The island was claimed for England by James I in 1608 and given the name of Tobago in hope that the crop tobacco would grow there. The newly formed colony of Virginia caused great excitement and hope for the profitable growing of this new cash crop. However, the initial claim was nominal only and disputed by the Spanish, Dutch and French. Besides, English settlers were more likely to head for Virginia or the newly established colonies of St. Christopher, Nevis or Barbados. Tobago was more awkward for English sailors to get to and was next to the Spanish Main and so was perceived as difficult to defend. There was an attempt from some English privateers to settle Tobago in 1625 and in 1626, Captain Robert Goddard called at Tobago for fresh victuals. He was very taken with the island and recommended the settlement of the Island to the Earl of Montgomery (later Earl of Pembroke). The Earl petitioned Charles I for the right to claim the island and was rewarded with a Letters Patent in 1628. Dutch settlers from Brazil identified the island as a potential new colony in 1627. They undertook a number of small scale attempts to settle the island. The first of which were undermined by disease and local Amerindian hostility. However it was the attempt by the Spanish in 1636 to drive out the nascent Dutch settlement that illustrated the danger of establishing such isolated colonies so close to the Spanish Main. Nevertheless, in 1637 English Puritans from Barbados attempted to settle there. Once again, Amerindians killed many of them and drove the survivors away to Providence Island. The Earl of Warwick purchased Pembroke's rights to the island and, in 1639, sent his own expedition to the island. This also was attacked and destroyed by Amerindians. 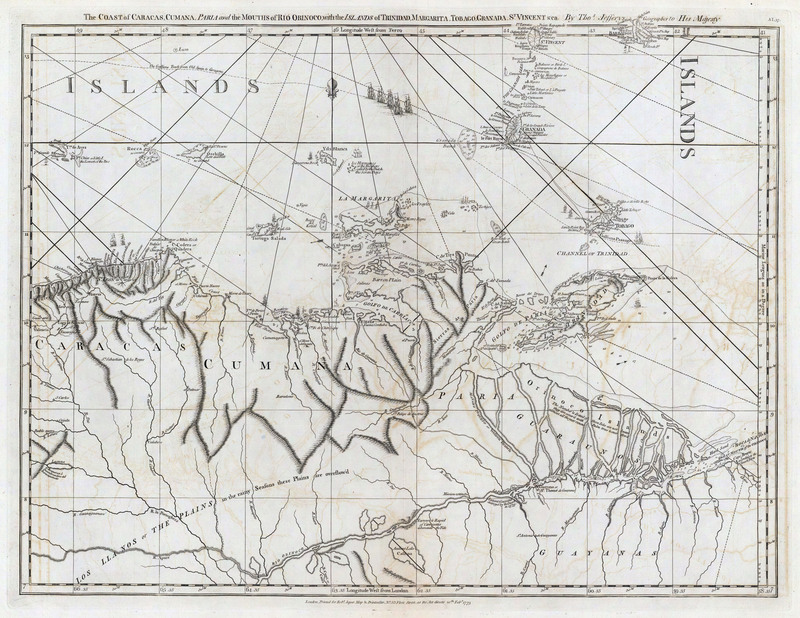 An expedition organised by James the Duke of Courland (A Baltic state connected to the English Crown) sailed to Tobago. These settlers made peace with the Amerindians but disease ravaged the settlement. 1642 saw both the Earl of Warwick and the Duke of Courland attempt to establish new settlements to grow tobacco and indigo. The Earl of Warwick sent Captain Marshall of Barbados to undertake his scheme. Yet again, local Caribs were hostile and drove out the English settlement. By this time the Earl of Warwick had become disillusioned with the prospects for the island and so content to sell his Letters Patent to the Duke of Courland in 1642. The Courlanders persevered a little longer, but under attack from Amerindians and disease the population fell to unsustainable levels and was abandoned by 1650. Small Dutch and Courlander settlements were attempted again in the mid 1650s but these came under attack from buccaneers and privateers principally operating out of Jamaica. By 1665, the island was effectively a safe haven for these pirates leading to the English sending an expedition under Lord Willoughby in 1666 to drive out the buccaneers and destroy their bases on the island. This in turn, caused the French to become involved. They sent a small fleet from the island of Grenada to evict the small English garrison left behind to police the buccaneers. The 1667 Treaty of Breda between the Dutch, English and French saw the Dutch return to the island. The Third Anglo-Dutch War from 1672 to 1674 saw the English return to the island once again in 1672 under the leadership of Sir Tobias Bridges. He captured the Dutch governor, seized 400 prisoners and effectively destroyed the Dutch colony and left the island abandoned. The war as a whole went badly for the English and the resulting Treaty of Westminster saw Tobago returned to the status quo ante bellum. This effectively ended official English involvement in the affairs of Tobago until the Seven Years War a century later. This did not mean that the ownership of the island was resolved. Dutch attempts to resettle the island again were soon ended when the French seized the island from them in 1676/7. The Treaty of Nijmegen in 1678 confirmed the island belonged to France although the French left it unsettled merely sending naval vessels to the island twice a year to ensure their claims were satisfied and to ensure that no unwanted settlers had arrived from elsewhere. Latent claims by the Courlanders to settle the island continued until the end of the Seventeenth Century. 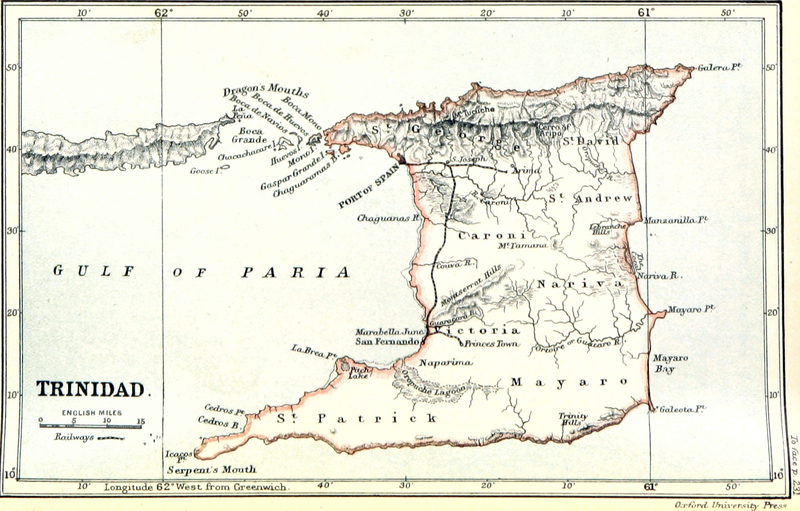 They claimed that Charles II had granted them all rights to Tobago by Charles II. However, the English considered that the succeeding treaties had usurped these rights and made them irrelevant and declared them null and void. The English government issued orders that no vessels should sail for Tobago from English or English colonial ports. Technically, the island lay dormant of Europeans and yet this very isolation helped attract pirates and privateers keen to escape justice and find replenishments and victuals. Both the English and the French found their naval ships patrolling the Tobago coastline for possible ships and bases on a fairly regular basis. The 1730s saw the descendants of Courland make another attempt to claim ownership of the island supported by the King of Poland. Ferdinand, Duke of Courland offered to sell the island to Sweden. However, on approaching the British government, the Swedes were told that the Courlanders had no claim to the island of Tobago. Despite not purchasing the island, Sweden did send a small expedition to the island to consider settlement. However the 25 families and their slaves were driven out by hostile local Amerindians. 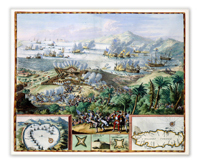 1748 saw the French attempt to land a small force from Martinique and set about constructing a fort with French troops. The British complained to the French government who in turn claimed that the governor of Martinique had exceeded his powers and asked him to withdraw the French troops. The two governments agreed to call the island 'neutral' and that neither would try to garrison or fortify the position. The French fort was destroyed as a gesture of good faith. The Seven Years War from 1756 - 1763 saw Britain and France wrestling for supremacy throughout the Western Hemisphere. 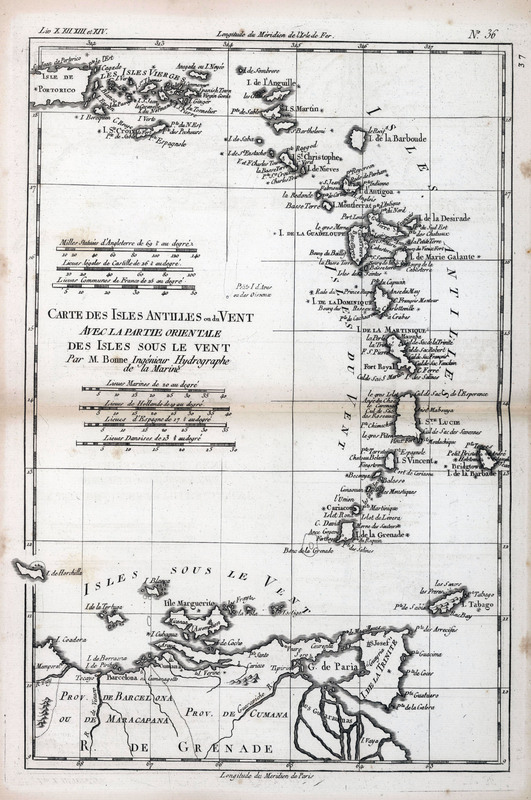 A concerted Royal Naval sweep through the Caribbean netted most of the isolated French islands - including Tobago in 1762. 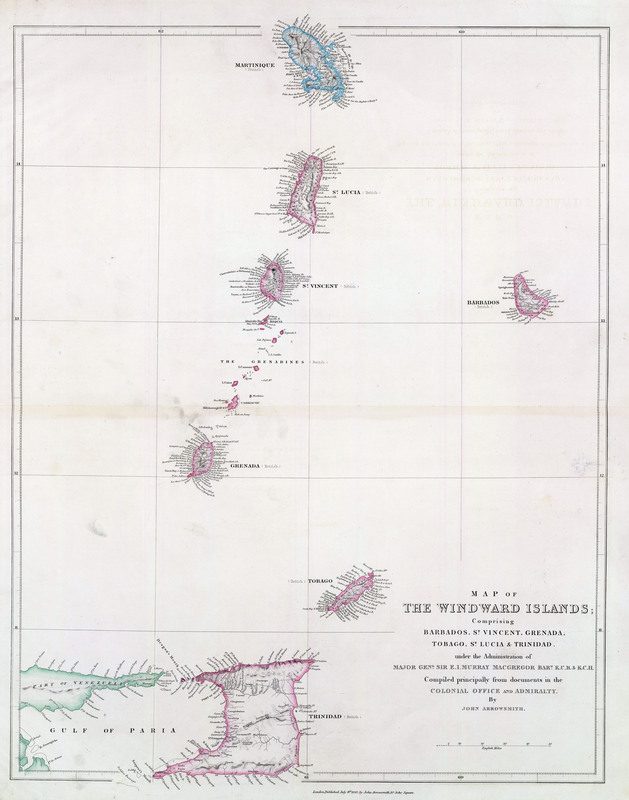 Many of the islands were returned to France at the conclusion of the war with the Treaty of Paris, however Tobago was specifically transferred to British sovereignty. British administration was directed from Grenada at first as the only inhabitants were Amerindians and a few French hunters. 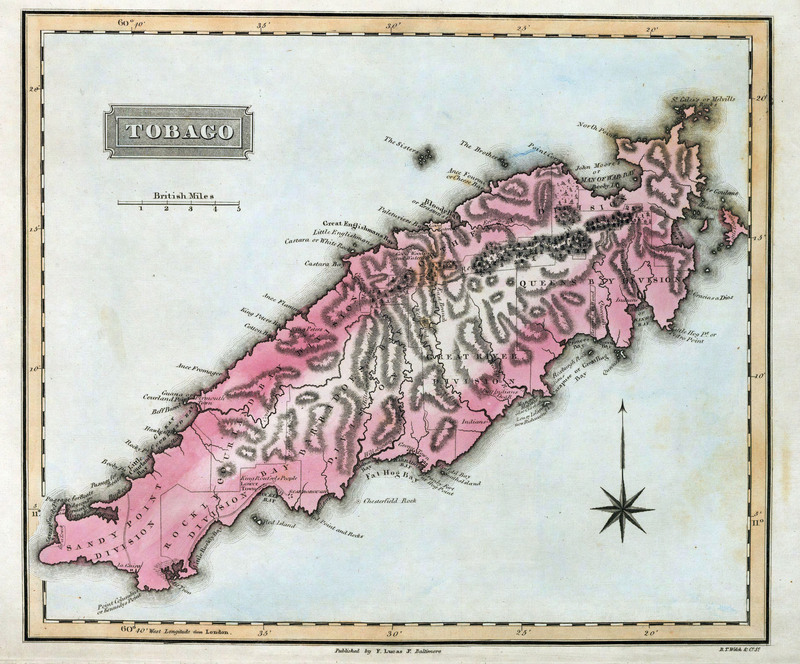 Tobago was divided into parishes and lots of land were prepared for sale. The first session of the Tobago Legislative Council and Assembly was held in 1768 at Georgetown before the seat of government was transferred to Scarborough in 1769. Early investors were interested in the cultivation of sugar which was achieving high prices back in Europe. Consequently, the initial investors also required slaves to clear, prepare and ultimately work their land holdings. The first sugar shipment left in 1770 but insurrections by the harshly treated slaves became a common occurrence throughout the 1770s. The European militia was called out on a number of occasions to restore order. Plans for the island to become a new sugar producing island initially faltered when it was found that the local ants devoured the sugar cane. Cotton was introduced to diversify the economy but the profitability of sugar meant that experiments with new strains of sugar cane were undertaken. The American War of Independence threw up the next set of challenges as trade was further disrupted in the Western Hemisphere and American privateers felt free reign to attack British possessions - including Tobago which they did in 1777. The following year an American Squadron of ships attempted to seize the island but was driven off. However, as the war escalated and the French and Spanish became involved, Britain and the Royal Navy in particular were becoming overstretched and found it difficult to defend all their possessions. 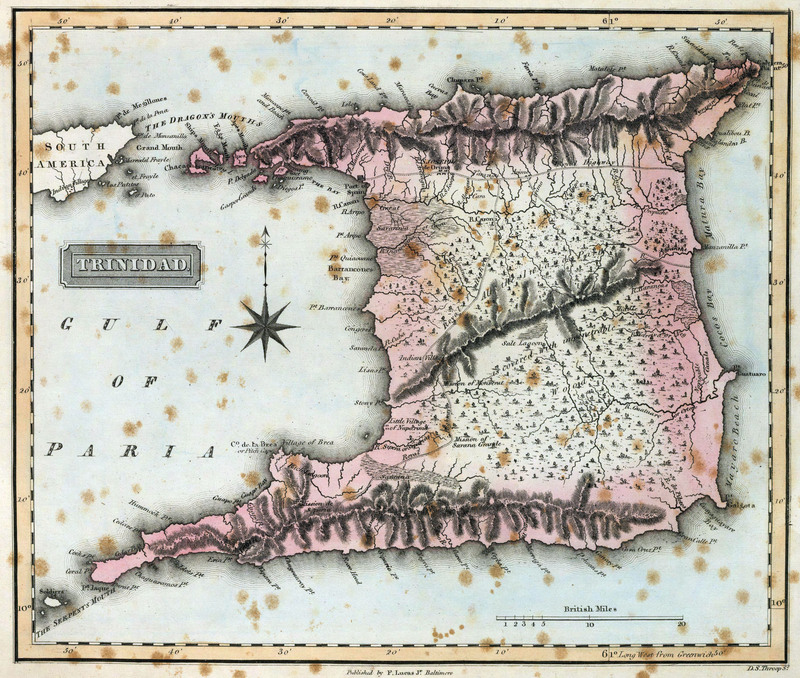 The island of Grenada, which was the main British defensive position in the region, was captured in 1779. Two years later Tobago was captured by the French after a fleet under the Comte de Grasse failed to be intercepted by Admiral Hood and the governor was captured. The Treaty of Versailles was more generous than had been expected thanks to some late Royal Naval victories in the Caribbean, however Tobago was still ceded to the French. The population of the island plummetted as land was seized by the French and British settlers moved elsewhere. However, there was no significant infusion of French settlers to take their place. French control was not to last that much longer as France was plunged into her own political difficulties. The French Revolution of 1789 spilled over into her colonies as Tobago's military garrison plunged itself into open mutiny in 1790 with much of the main settlement of Scarborough being destroyed as a result. The British sent a force from Barbados to seize the isolated island of Tobago in 1793 and returned it to formal British control once more. The British established a militia for the defence of the island in 1794. This was augmented the following year by the creation of the Corps of Black Jaegers. This interesting formation was actually formed from 100 trusted slaves who were under the command of European officers. An oath of allegiance to the British Crown was required for all the inhabitants and those, mainly French, who refused were interred as Prisoners of War. The Revolutionary and Napoleonic Wars severely disrupted trade and had a devastating effect on the economy of the island. Furthermore, local crops failed in 1800 leading to famine and severe difficulties for the local population. The following year, a widescale insurrection of slaves was only narrowly averted when the authorities seized 30 suspected ringleaders and publicly executed one of them. The 1802 Treaty of Amiens brought a temporary secession of the Napoleonic Wars and sought to return many of the territories to their original owners. Consequently, Tobago was assigned back to France. This was to be a short term arrangement as the peace barely lasted a year. 1803 saw the British return and they seized the island once more. American ships were specifially given permission to visit the island contrary to the normal Navigation Acts. This meant that food and supplies could get to the island and exports could be sold. 1807 saw the Slave Trade abolished throughout the British Empire and so there was to be no new fresh infusions of slaves. There were still 15,000 slaves on the island at this time, but there were also many free blacks who had bought or had been rewarded with their freedom for helping the British against the French. 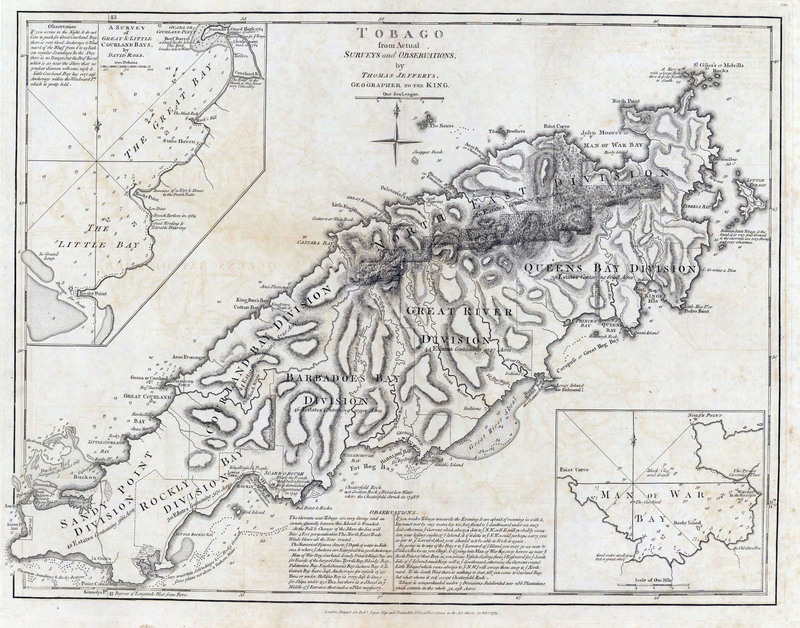 Tobago was awarded to Britain upon the conclusion of the Napoleonic Wars and her sovereignty would never again be challenged by rival European powers. She was to remain in the British Empire until independence. Although her administration was still to take a number of changes within the Empire as she became a part of the Windward Islands Colony from 1833 until it was transferred to Trinidad in 1889. The 1830s saw a further profound change to the economy of the island with the abolition of slavery in 1834. Initially this was replaced with an apprentice scheme that tied the freed slaves to their former masters in return for board, lodging and employment. Many felt that this was little better than the slavery which it had replaced. Intense lobbying back in London saw the Apprentice system itself abolished in 1838 and ex-slaves were free to choose their employment. Unfortunately, the price of sugar had already begun to fall, although cotton maintained its value. Many former slaves were reluctant to work on their old plantations and so turned to fishing or moved to the main settlements to seek menial work. However, other freed slaves moved around the Windward Islands colony from island to island hoping to find new opportunities and escape their old lives of drudgery. In practice though, these labourers found that the old plantocracy and owners were often one and the same and had been the ones calling the shots in the days of slavery and found little improvement in their conditions. Technological advances saw steam ships begin to replace the old sailing ships from the 1840s. The more robust mail and delivery systems were also a factor in Britain offloading its defensive obligations to the island in the 1850s. The last garrison was withdrawn in 1854 and the island was requested to provide for its own defence and policing. A land tax was introduced in 1852 to prepare for these new obligations. The Royal Navy also kept vessels in the region to call in in case of trouble and emergencies. The 1850s and 1860s also saw a fresh infusion of Africans from the tiny Atlantic island of St Helena. These were actually ex-slaves that had been picked up by the Royal Navy in its anti-slavery patrols along the coast of West Africa. Unsure of where to return the freed Africans, some were brought to the West Indies to provide labour. The 1860s saw a mini boom as the commodity prices increased in the wake of the American Civil War. 1876 saw an outbreak of violence and unrest known as the Belmanna riots. These were instigated largely by migrant labourers who had moved from Barbados and had yet to find a significant improvement in their livelihoods. They were principally protesting at low pay and frequent stoppages and layoffs to suit the needs of the employer. There was also real resentment at the residual power of the planters and landowners who still dominated the Legislative Assembly. Riots elsewhere in the Windward Islands only accentuated British sensibilities. Tobago was to be rewarded with Crown Colony status in 1877 ostensibly as a way to help protect the poorer people in Tobago from the entrenched political and economic power of the plantocracy. It also meant that reforms and administrative changes could be more easily instigated without privileged lobbies holding them up. The 1880s was to confirm that the old plantocracy was indeed in trouble. The price of sugar had continued to drop as had cotton with the return of the American producers in the wake of their Civil War. 1884 shocked the economy of the island when its largest employer and landowner ceased trading: Messrs A. M. Gillespie and Co.. Its dissolution saw the value of land and prices collapse on the island. Tobago had actually fared better than most sugar island economies as it had had a more diversified economy than most. However, the collapse of Gillespie and Co. rocked the finances and economic viability of the island economy. Land was traded at a pittance of its pre-1884 value. 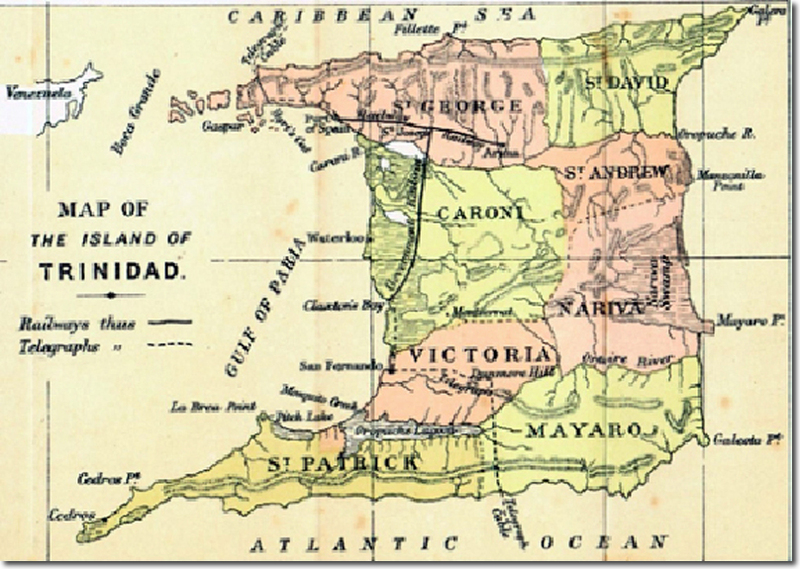 The British sought to ameliorate the situation by administratively joining Tobago to the larger island of Trinidad to its south. This southwards move was intended to ensure that Britain avoided taking on debt and expensive provisions for Tobago and transferring the liability to the colony of Trinidad. It should be said that for many years, this administrative change had little effect with minimal coordination in infrastructural and economic development between the islands. Indeed the first steam service between the two islands did not begin until as late as 1910. 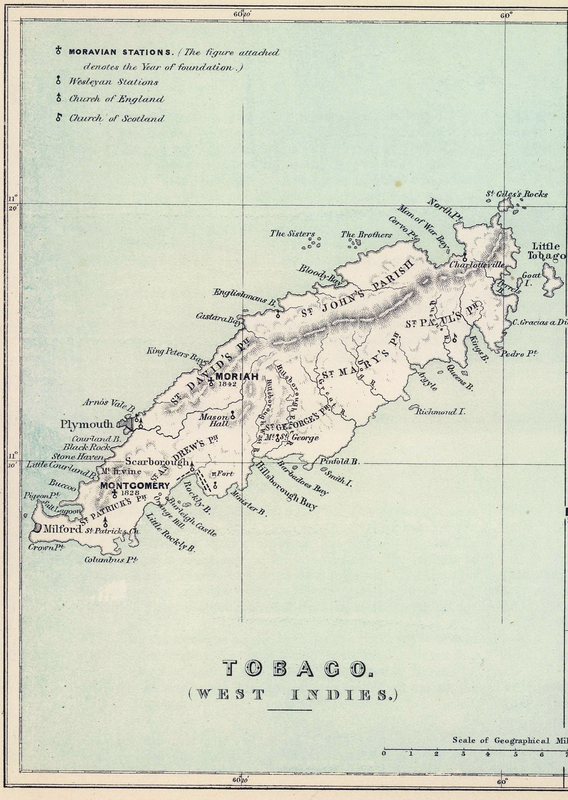 From 1889 on Tobago would be an outlying obligation for the larger Crown Colony of Trinidad. Similar to Tobago, Trinidad had been brought to European attention by Columbus who discovered the island on this third voyage in 1498. 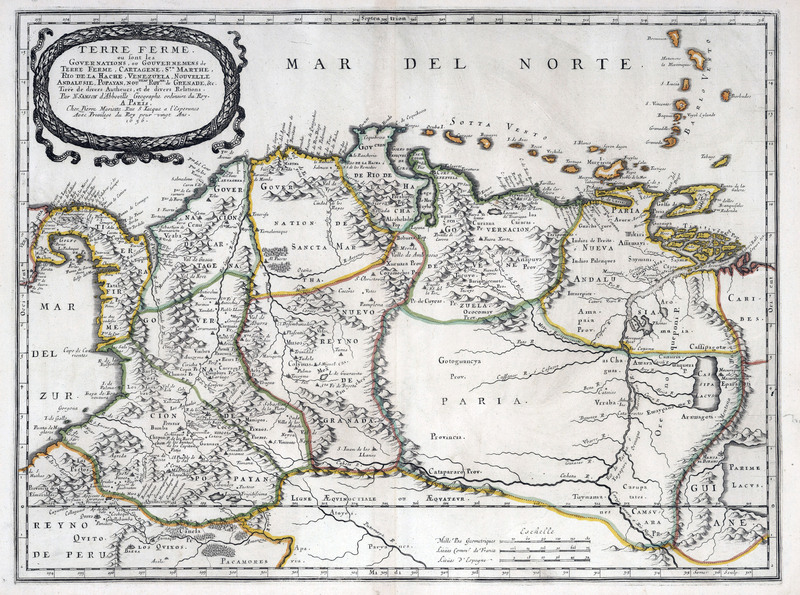 Regionally, the Spanish settled on the smaller and more manageable Isla Margarita which became their administrative centre in the region. However, during the Sixteenth Century Spanish slavers made repeated raids on the island, and settlers began to eye the land and resources and made attempts to plant colonies on the island. The first significant English contact with the island came in 1595 when Sir Walter Raleigh landed there to as part of his quest to discover El Dorado which he believed was located along the nearby Orinoco River in Guyana. He wished to question the Spanish explorer Antonio de Berrio who had settled on Trinidad. The English sacked the main settlement of San Jose de Oruna and interrogated de Berrio extensively before sailing onwards to Guyana on his ultimately disappointing quest. He returned two decades later to Trinidad and the Orinoco River on his second and equally disastrous expedition to search for El Dorado. Originally Spain joined a coalition with Britain against Revolutionary France. At this time, the Spanish authorities on Trinidad were grateful for the Royal Navy's active presence in the region in maintaining the sealanes and seeking to prevent rebellions and uprisings. However, in 1795 Spain was defeated by France back in Europe and sued for peace and agreed to recognise Revolutionary France. 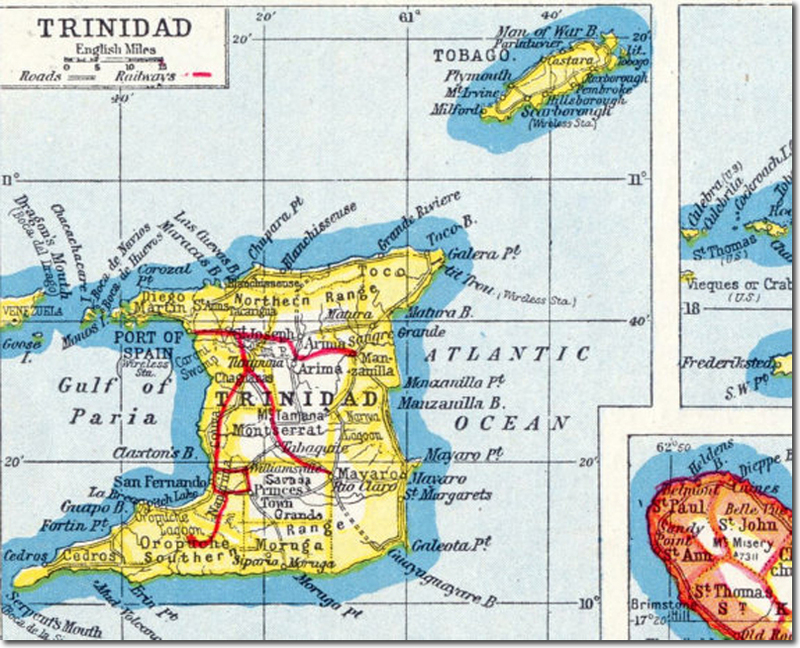 Whilst Spain was technically a neutral nation in the European conflict, a strange event occurred on the island that helped illustrate the growing complexities of alliances and allegiances in the Post-Revolutionary Caribbean. Two Royal Navy ships, HMS Alarm and HMS Zebra entered Trinidad's waters in pursuit of French republican privateers. Captain Skinner of the Zebra came ashore to discuss the pursuit of these privateers with the Spanish authorities who were sympathetic in having them removed. On leaving port, HMS Zebra was attacked by the privateers who thought it was a British merchant ship and thus easy pickings. They were astonished to find that they were attacking a British frigate which in turn sunk the entire flotilla of privateers. After sinking the French ships, the Zebra returned to the Leewards. But the Alarm put in to Port of Spain. Whilst there, some of the French survivors had come ashore and began fighting with English sailors whilst Captain Vaughan and other officers were visiting local dignitaries. The fight soon turned into a major conflagration with French republican sympathisers joining in with the privateers. The outnumbered English only escaped through the back windows of a local house and the arrival of Spanish troops to restore order. Outraged at the treatment of his sailors, the following day Captain Vaughan gathered almost his entire complement of crew and landed them to seek revenge. French republicans raised 3 - 4,000 men to meet this landing party. The Spanish authorities, with their meagre supply of soldiers, were in despair at the unfolding events in what was technically a neutral island at this point. The governor implored the English to return to their ship saying that the large French population would rise up and kill English and Spanish alike. Captain Vaughan finally relented and he returned to the ship, but under the catcalls and shouting of the hostile French population. That evening widespread rioting broke out in the settlement, particularly directed towards anyone of English or Irish descent, as the French celebrated their 'defeat' of the English. Humiliated and realising that he had overstepped his authority, Captain Vaughan committed suicide. Five months later, Spain formally joined the French and so became an enemy of Britain. The Royal Navy had already undertaken a significant sweep through the Caribbean in 1795/6 under Admiral Dundas in an attempt to seize French overseas assets and colonies and undermine her economic ability to wage war in Europe. The campaign had been relatively successful, if expensive in financial and manpower terms (especially from disease). This Caribbean expedition had left Spanish possessions untouched in this first sweep. With the changing allegiance of Spain, Dundas decided to undertake a second, if smaller, Caribbean expedition in 1796/7. 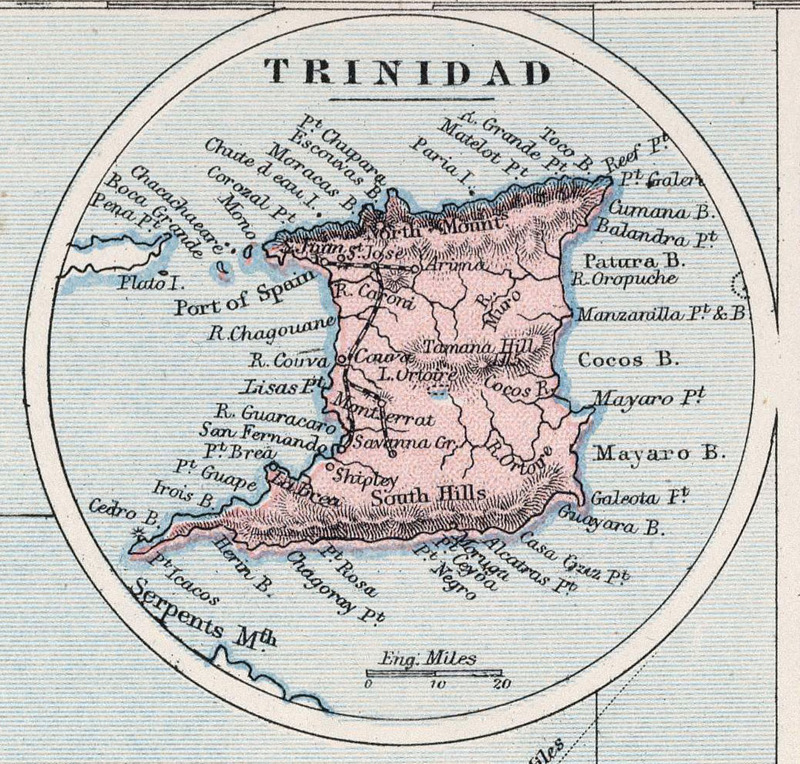 The first target was the Spanish colony of Trinidad which was seized relatively easily in February 1797 under the direction of Sir Ralph Abercromby. Although the island had been reinforced by some 600 Spanish troops and 5 Spanish warships, these were no match for the 18 Royal Navy warships, 40 troop tranports and 7,000 soldiers. Realising the hopelessness of the situation, the Spanish scuttled their own small fleet of ships still in harbour and surrendered after brief resistance. The only casualty of the invasion was when one of the Spanish canons exploded killing one of its gunners. Given the rapid capitulation of the Spanish defenders, the British offered generous terms of surrender. The Spanish soldiers were to be returned to Spain, the officers could keep their swords, all private property was to be respected, government property was to be handed over to the British, all Spanish laws and contracts were to remain in force, freedom of worship was granted and free people of colour were to maintain their liberty and freedom. By this agreement, the British began their period of occupation very much in sympathy with the previous Spanish administration - at least that was the original intention. A garrison of 1,000 soldiers remained as the rest of the expeditionary force left for Puerto Rico (and ultimate defeat there). Meanwhile, back on Trinidad, many French republicans slipped out of the colony or bit their tongues. French royalists were overjoyed at the change in ownership and many volunteered to help maintain law and order on the island and join the militia. Many Spaniards took the opportunity to sell up and either move to the Spanish Main or back to Spain itself. The poorer inhabitants and slaves had little choice but to accept their new overlords. The first full time governor appointed by the British was Thomas Picton who would later find fame as a soldier in the Peninsular War and the Batttle of Waterloo. However, he was to prove a controversial governor of the island of Trinidad during his six year tenure. He found he had more in common with French aristocratic plantation owners than newly arrived Britons hoping to secure more economic and political rights for themselves. Thomas Picton was a military man who was mindful of the state of war that existed for much of his tenure and was also aware of the slave revolt on Santo Domingue and tensions throughout the Caribbean colonies where small white minorities were surrounded by large numbers of slaves. Consquently, he brought in a more severe slave code in 1800 to replace the much more lenient Spanish predecessor code. 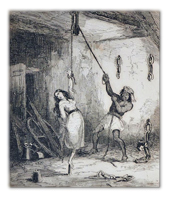 Runaway slaves were to be punished by floggings or having an ear cut off and was designed to intimidate the large slave population. Picton was a military man who sought law and order above all else. However, he was accused of overstepping his brief by failing to honour Britain's original intentions to honour Spanish customs and laws - notably through his new slave code. London was also frustrated that he seemed to be creating a new British slave colony just as abolitionists back in Britain were making political ground in the fight against slavery. The British Government had intended that Trinidad be a settler colony for Spanish and British smallholders and traders and that it might be used as a base to trade and deal with South America. This was particularly the case when official Spanish control of the mainland appeared to be slipping under the pressure of the Revolutionary and Napoleonic Wars and the fact that Spain was finding it hard to maintain communications with her South American colonies. Picton had been instructed to help foment disturbances in Venezuela for instance, but had done little to follow up these orders. Rather, he had been influenced by the harsh French Royalist emigres from Santo Domingue and Martinique. These had brought not only their slaves but also their fear and distrust of slave uprisings with them and encouraged the governor to suppress any dissent ruthlessly. London attempted to rein in the power of their governor who was treating Trinidad as a military fiefdom rather than encouraging a new settler society to be built under his aegis. A special governing Commission was created with William Fullerton and Samuel Hood joining Picton in governing the colony from 1803. The Commissionners disagreed with themselves on how best to rule the island particularly when war broke out again. Despite these administrative difficulties, William Fullerton discovered the harshness of Picton's period of rule and in particular the case of his granting permission to torture a 14 year old girl suspected of involvement in a robbery. Picton was recalled to London in 1803 and would later be charged with multiple offences regarding his exceeding of his powers as a governor. Ultimately, only the one accusation of his torture of Louisa Calderon would actually succeed. He was found guilty in 1806 but this was later quashed under appeal. Nevertheless, Picton was disgraced and a more liberal regime was instituted in Trinidad. Picton himself somewhat redeemed himself on the battlefields of Europe where he was given a second chance by the Arthur Wellesley (Duke of Wellington) and proved himself an admirable military leader before being killed at Waterloo. When it came to the temporary Peace of Amiens, the French had been keener to trade away her Allies' possessions rather than her own. 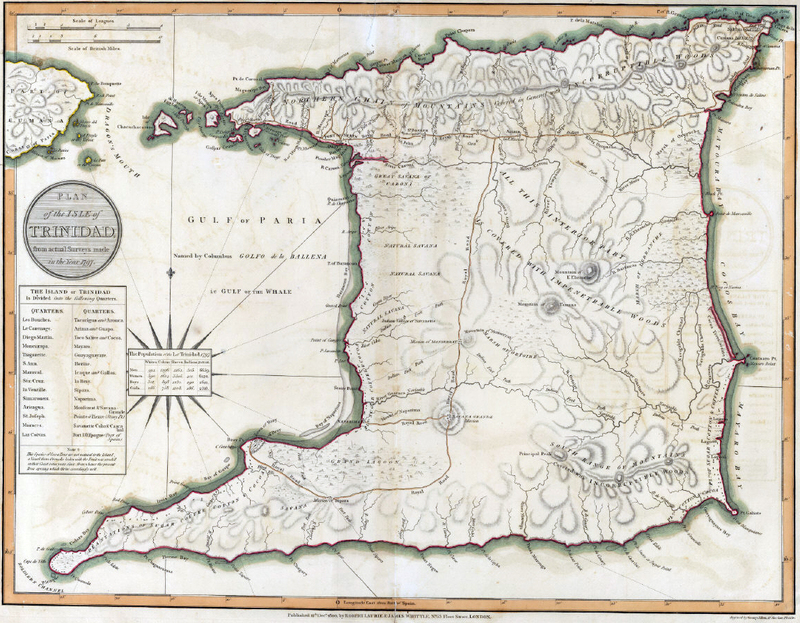 Consequently, Spain had been formally forced to cede Trinidad to the British in 1802. 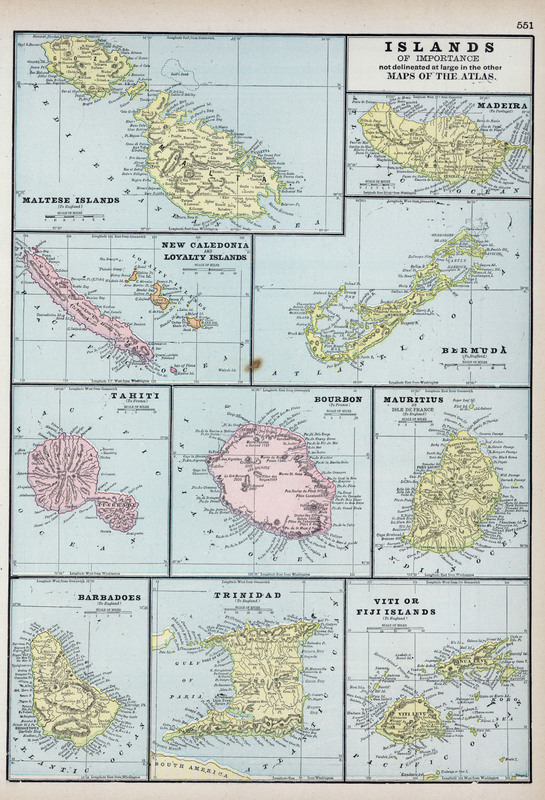 The British declared the island a directly governed Crown Colony. The reason for its being declared a Crown Colony rather than as Tobago's representative legislative was because the authorities were unclear what the Hispanic and French population would do with elective powers and were concerned that the Amerindian population might be further sidelined. Rather than take any democratic risk that might see communities pitted against one another. Later, in the 1830s when the slave population had been given its freedom, calls for a representative government were once again declined for fear that the plantation owners might use any enhanced powers to dominate the economy and society yet further. Most settler governments relied on a property qualification which the freed slaves could not hope to attain. 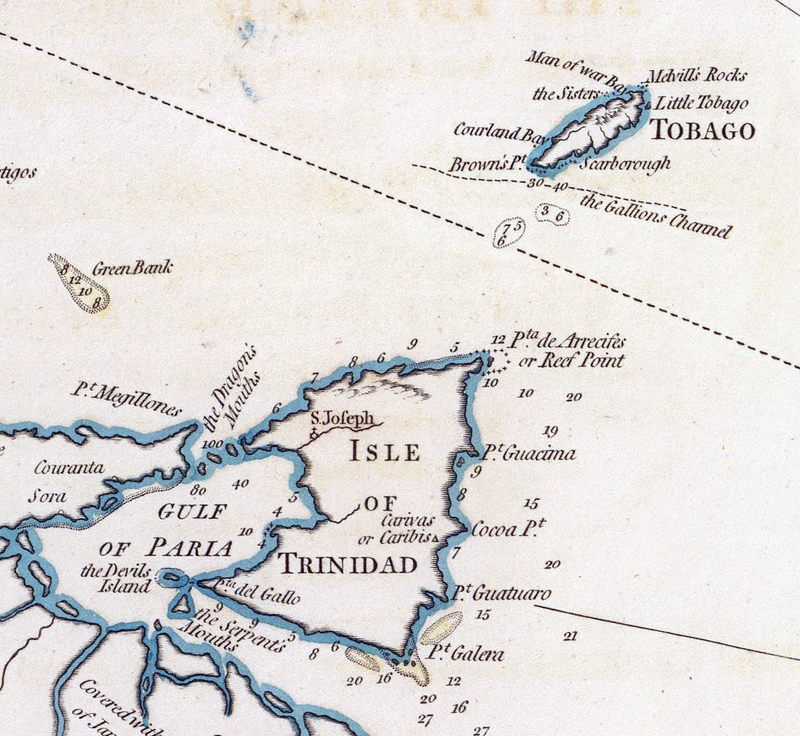 London had hoped that Trinidad could be used as a useful place to trade with South America. When Spain had governed the vast continent it had instituted monopolistic trading restrictions which had cut British merchants out of any opportunities. In the early years of the 1800s, Britain foresaw using Trinidad as a base to encourage uprisings in Venezuela against the Spanish rulers. However, in 1808 Spain became a formal ally of the British and so Britain's support for South American revolutionaries was quashed almost overnight. This did not stop revolts from happening on the continent (some being directed from Trinidad) and the Spanish losing control of much of the continent over the next decade. Much like in Santo Domingue however, the revolutions often ran out of control, as it did in Venezuela when Spanish Europeans were executed and arrested en masse. 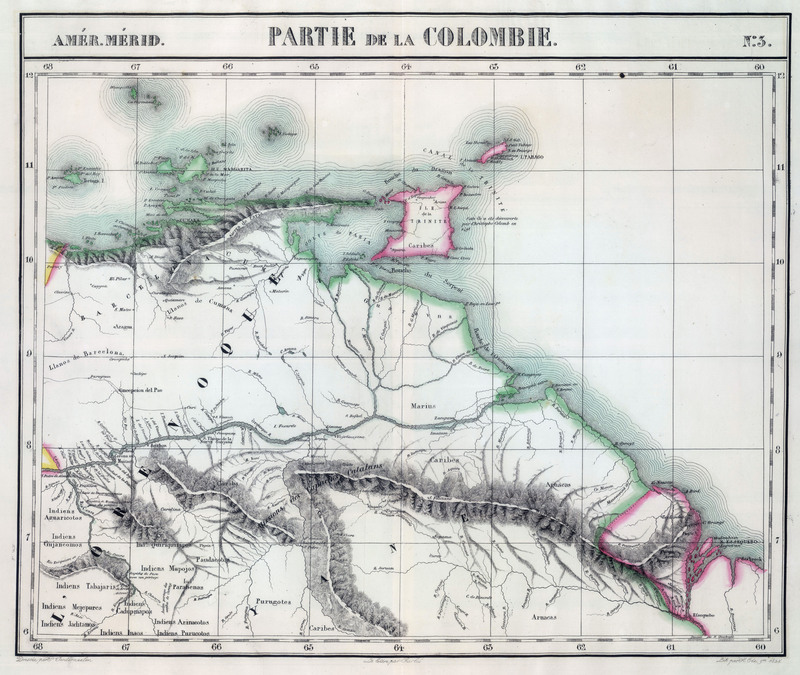 Trinidad would consequently see a re-infusion of Spanish settlers as they fled the worst excesses on the South American Continent for the relative peace of the British colony of Trinidad. Slaves on Trinidad found that they had enhanced rights over slaves in other European Caribbean colonies - especially after Picton's codes had been rescinded. The post of a 'Protector of Slaves' to act as an advocate and intermediary for slaves had been enshrined in Spanish Law. The British authorities kept this post in place and passed a number of additional laws to ameliorate the worst excesses of slavery particularly in the 1820s. In many ways, Trinidad was an area of experimentation to see just how far the British Empire could wean itself away from the institution of slavery without abolishing it. What is all the more remarkable is that this was done during a period of High Tory office back in England. The Whigs were to abolish slavery in 1834 but the system of Apprenticeship was resented still by freed slaves until it also was abolished in 1838. 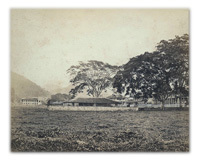 Sugar was a declining industry but a fresh cash crop was introduced with cacao cultivation. These plantations did not require as much land or investment as the old sugar plantations had demanded. Land was set aside to settlers who wished to develop cacao estates and locals were to be joined by Spanish emigres from Venezuela who had long experience in cacao cultivation. Chocolate as a hot beverage (and taken with sugar) was becoming a new and popular drink in Europe. In 1847, Fry's would make the first solid chocolate bar which would help transform the popularity of chocolate and so increase the value of cacao. As in many other Caribbean colonies, the ex-slaves were reluctant to work on their former plantations. Remarkably rapidly, plans were made to import indentured labourers from Asia and particulary India to fill this void. The first programme began in 1839. These labourers were compelled to work long days, six days a week for three years in total. They were supposed to be given free passage home, but many traded in this option or took on additional terms of indenture. Thousands of mostly Indian labourers arrived in the colony over the coming decades. By the time the Government of India put a formal end to the practice in 1917, over 130,000 labourers had travelled to Trinidad, the majority of whom stayed. The other option to replacing manpower was the adoption of steam power. 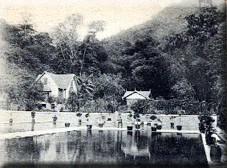 By the end of the 1840s nearly all of Trinidad's plantations had switched to steam power. It was a remarkable transformation of the means of production brought about largely by importing the expertise and systems from Britain or surrounding British colonies. The sugar industry took another hit when the Sugar Duties Act was passed back in Britain in 1846. It was designed to reduce and eliminate all preferential tariffs by 1851 (later delayed to 1854). This meant that the privileged access to the British markets by West Indian sugar producers would be lost for good. There was concern that the 'free' sugar producing islands like Trinidad could not hope to compete with the 'slave' sugar producing plantations in Brazil and Cuba. A longer term threat though was the increasing production of sugar beet in Europe which could be planted on marginal land in harsh conditions. The authorities also countered that the procedures to bring in cheap indentured labour would be streamlined and eased to help maintain the competitiveness of the sugar islands. Increasingly, it was to become trading and merchant houses that could gain access to the finance and expertise to run and modernise the plantations. The old aristocracy was being supplanted by public limited companies and experts. Total sugar production from Trinidad actually increased decade on decade until the 1890s despite the fall in sugar prices. She was to be one of the few colonies (along with British Guiana) that weathered the economic storm relatively well. Although even Trinidad could not ride out the collapse in sugar prices in the 1890s and 1900s. The other main economic diversification was as a result of discovery of oil in 1857. Unfortunately at first oil was not as valuable a commodity as it later became and so the first attempts to pump oil met with little commercial success. However, after the internal combustion engine was invented in the 1890s and the Royal Navy switching from coal to oil in 1911, the commercial viability of Trinidad's oil became apparent. By 1910, it was pumping nearly 50,000 barrels a year. 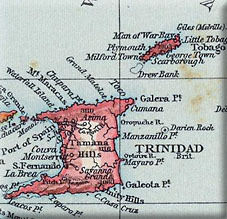 Trinidad and Tobago were formally joined in 1889 largely due to the problems on Tobago rather than for Trinidad's beneift. By the time of the Union, they were both Crown Colonies - Tobago having lost her elected Assembly back in 1877. At the time, Trinidad's economy was relatively healthy but there were dark clouds on the horizon. Both France and Germany increased subsidies to their sugar beet farmers which saw a glut in sugar production and a further collapse in sugar prices. 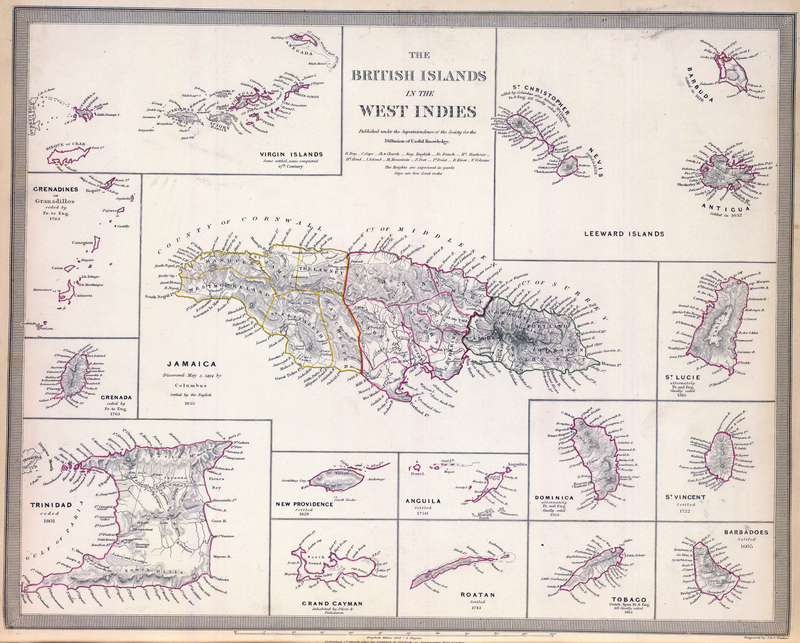 The West Indies in general suffered and Trinidad and Tobago were no exception. They were also doubly hit by the collapse in regional trade due to the crisis in confidence. The British colonial authorities were so concerned that they set up a Royal Commission to investigate the reasons for the West Indian crisis. It encouraged the improvement of colonial infrastructure and lobbied the French and German governments to remove their subsidies. The new century saw the colonial authorities invest in the infrastructure of the colony. This was to have serious consequences however when the local population was asked to pay more for their water after a national waterworks infrastructure had been constructed. These spilled over into violence in 1903 with the so-called 'water riots'. Protesters threw rocks at the legislature who had to cower beneath their tables for protection. The protesters then set the lower floor on fire, at which time police opened fire on the crowd, killing sixteen people, and injuring forty-two others. The 'Red House' the old government legislative building was totally gutted and took much of Trinidad's records and official papers with it. The resulting commission investigating the disturbances recommended that water management affairs fall under the rule of local rather than central government and did much to diffuse the suspicion of islanders. Workers were not content to wait for the colonial government to solve their problems for them. The Trinidad Workingmen's Association was formed as an early proto-Trade Union Organisation. In addition to preserving the conditions of its workers, it also sought to lobby the colonial authorities for improved constitutional representation and to have local taxes reduced. It later modified itself into a fully fledged political party; the Trinidad Labour Party in 1934. Other Trinidadians sought solace from the economic difficulties through racial consciousness. J.J. Thomas published Froudacity in 1888 which called for blacks to unite and work together for their own benefit and to seek improved links between the New World and Africa. These ideas were also very much in reaction to Social Darwinist ideas of racial superiority. They also took inspiration from black activists in the United States. In the wake of the First World War and the contribution of colonies like Trinidad and Tobago in manpower and in resources, Britain deemed it wise to reward their loyalty with increased representative powers. 1925 saw the first elections to a new Legislative Council. The franchise was determined by income, property and residence qualifications, and was limited to men over the age of 21 and women over the age of 30 - there was no racial criteria per se, but whites were more likely to reach the minimum income and property requirements. Only seven of the thirteen members were directly elected with the Governor appointing the other six. The Trinidad Workingmen's Association won a seat for its leader Arthur Cipriani. These were baby steps to more represenative government, but forward steps nonetheless. The 1930s was another dark time for the colony given the Wall Street Crash, Great Depression and worldwide collapse in commodity prices. The turbulent decade saw workers strike and people riot due to rising prices and declining incomes. The moderate Trinidad Workingmen's Association lost ground to the more militant but intriguingly named "British Empire Citizens' and Workers' Home Rule Party" which was better known as the "Butler Party" after its leader Tubal Uriah Butler. This had been formed in 1936 after he acrimoniously left the Trinidad Labour Party. Butler was arrested in 1937 after behing held responsible for Labour Riots breaking out that year. He was not released until 1939. He was rearrested when war broke out as a potential security threat especially to one of the British Empire's safest sources of petroleum. In the first election by universal suffrage in 1946 the party came second. In the subsequent election of 1950 it was the largest party but failed to reach out to other parties who coalesced in a grand coalition against Butler's radical stance. The Butler Party never recovered and the more moderate People's National Movement under the historian Eric Williams began to emerge. 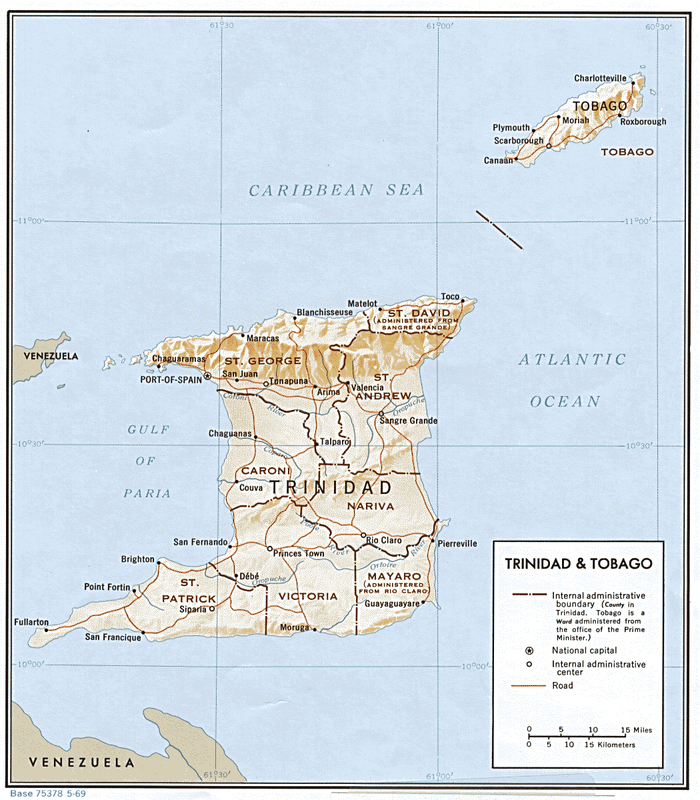 The Second World War saw Trinidad thrust back into armed conflict. German U-boats could range much further than they had in the First World War and tankers going to and from Trinidad would become a valuable target for them. Churchill granted the Americans Air Bases in 1940 in Trinidad to help patrol the seas around the island for U-boat activity. This was part of the lend-lease deal that saw the technically neutral United States give Britain 50 destroyers in return for military bases throughout the Caribbean and Americas. In addition to anti-submarine duties, Trinidad soon became part of an important air route from the USA to Europe from Florida to Trinidad to Brazil to Sierra Leone and then to North Africa or up to Britain. It soon became a major thoroughfare for the Allied war effort. Unlike in the First World War, black and mixed race Trinidadians were not prevented from taking commissions in Britain's armed forces or serving with front line units. This was at the insistence of the Colonial Office who understood that expectations of colonial volunteers would demand a level of equality of opportunity and respect. Volunteers served in all three of the armed forces but the RAF tended to be the most relaxed of all in training willing recruits. 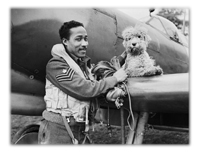 Flight Sergeant James Hyde (pictured) became something of a cause celebre and allowed the British armed forces to portray themselves more favourably against the racist attitudes coming out of Germany. The post war world saw American influence on the rise in the Caribbean whilst British influence waned. A new Labour government in Britain encouraged migration to the home country in order to help rebuild the economy. Trinidadians joined with the first influx of Caribbean workers on board the MV Empire Windrush in 1948. Indeed, one of the most famous passengers on the ship was 'Lord Kitchener' a calypso singer from Trinidad. By chance, he was filmed singing "London Is The Place For Me" as he disembarked from the ship. A steady stream of Trinidadians and Tobagonians headed to the Britain of full employment throughout the 1950s and 1960s. Back in the Caribbean, the British experimented with Federations in order to make their Caribbean colonies more economically resilient and self-sufficient. The plan came to fruition in 1958 and the seat of the new Federal Government was designated as Port of Spain. However, almost immediately problems broke out. 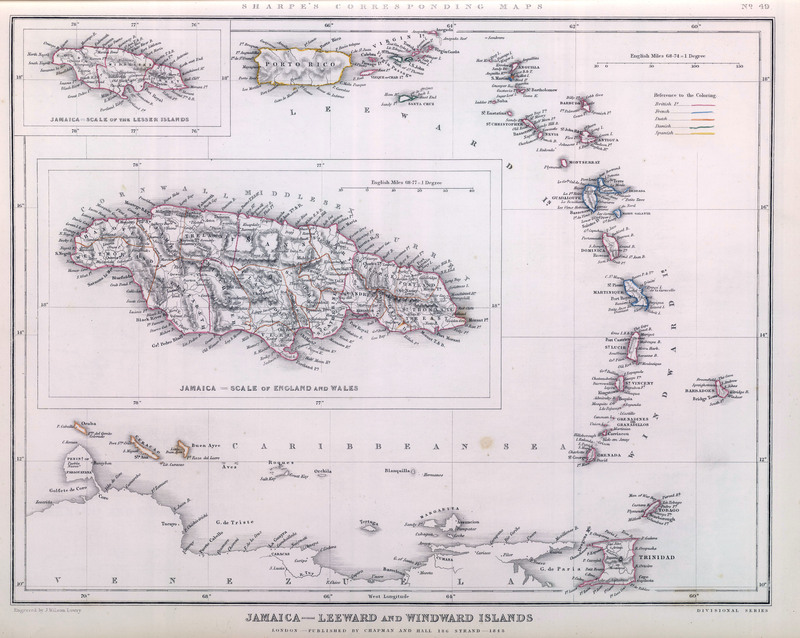 The smaller Caribbean islands demanded equality with the larger islands of Jamaica and Trinidad. 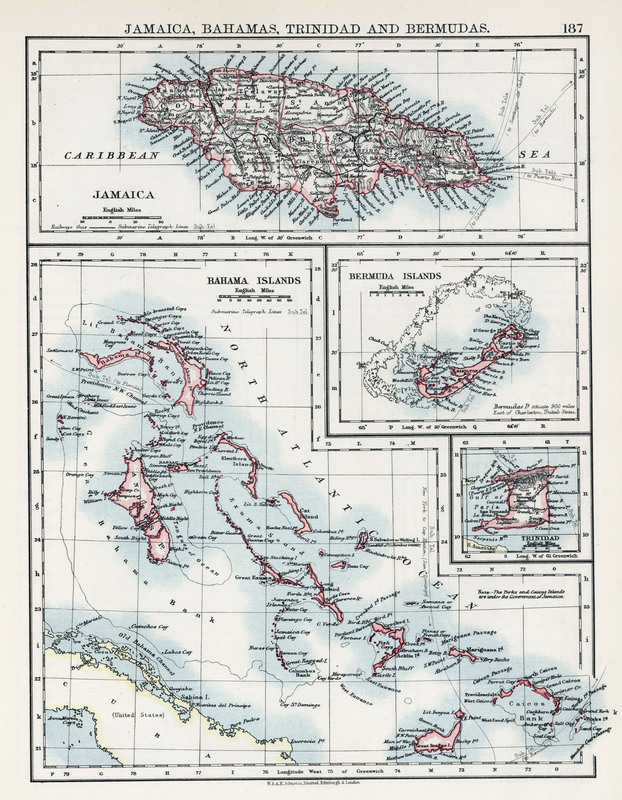 Jamaica and Trinidad resented the thought of having to bankroll the poorer and more isolated Caribbean island members. There were concerns at the freedom of movement which would see poorer people gravitating to the richer colonies seeking employment when those colonies had their own employment issues to deal with. The number of Caribbeans heading to Britain confirmed the difficulties in finding employment in the relatively low wage island economies. The Trinidadians and Jamaicans, despite having much in common within the Federation, fundamentally differed on what approaches to take. Trinidad, under the leadership of Eric Williams, sought to speed up Federation so that Dominion status could be achieved more rapidly and more rights that would come with that status. Jamaica, under Norman Manley, felt that Federation was slowing down the day of independence and that Jamaica, with American investment, could survive best by itself. It held a referendum which effectively killed off the Federation in 1961. Trinidad, despite its desire to make a success out of the initial Federation, was now reluctant to continue to carry the eight poorer members of the Federation alone and sought to extricate itself from the remaining Federation and requested its own independence which was granted in 1962. 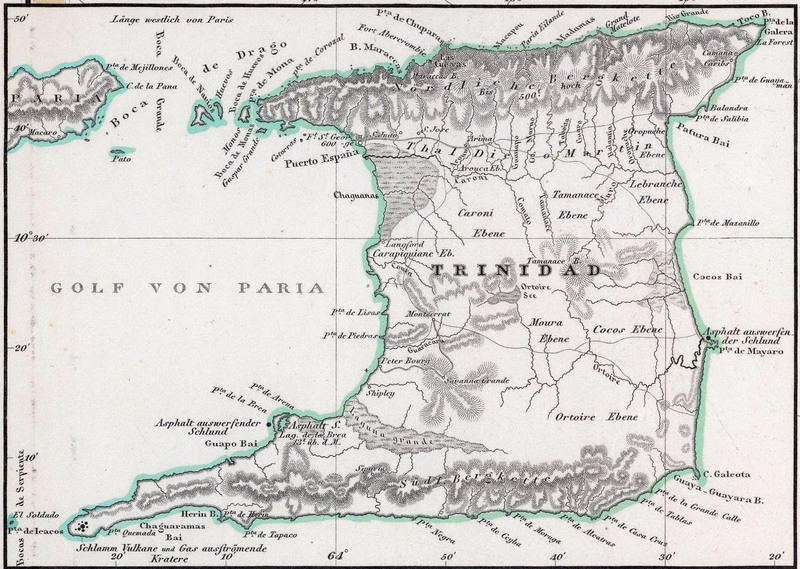 European colonisation and connection to the islands of Trinidad had lasted over four centuries. 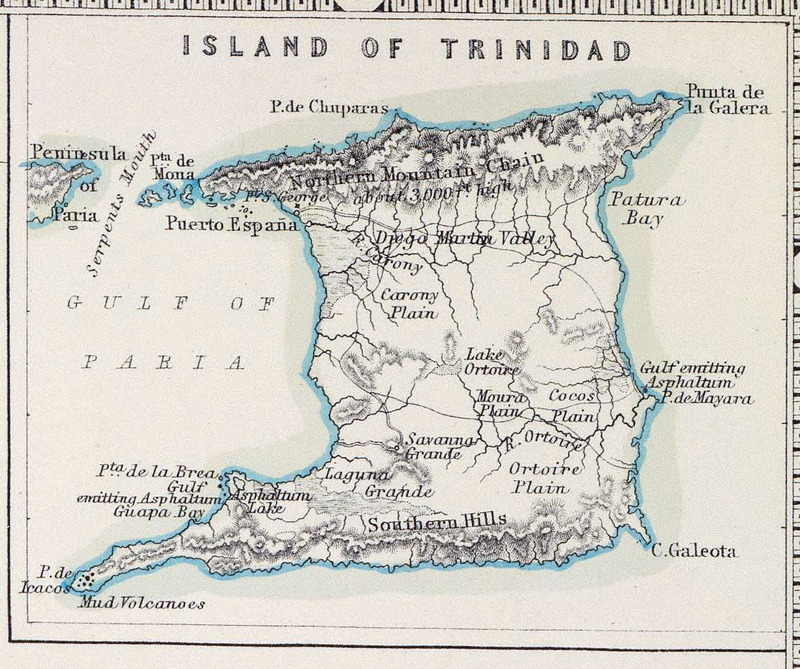 The island of Trinidad pulled in multiple directions. Much of its population had come from overseas, either Europe, Africa or Asia. Its size made it much larger than its Caribbean neighbours and yet its location off the South American coast near the Orinoco River Delta meant that it had strong historic and geographical connections with the mainland of South America. And yet, Britain pulled the island away from that South American destiny when it defeated the Spanish in 1797 and brought the island into the Anglosphere and towards a more Caribbean identity. There are few colonies which have had such a diverse series of influences. And added to Trinidad's diversity is the very different historic path of Tobago - which changed hands even more times than Trinidad and had its own settler path towards development which gave it a culture and history distinct even from Trinidad's. That these two islands coexist in a modern nation state is another one of those strange colonial legacies that only makes real sense when explained through the prism of imperialism. Justin Trevor Moon gives an - at times witty but also brutally honest - account of spending time in Trinidad training to be a Colonial Agricultural Officer and then putting that expertise into operation on the coast of Kenya in the 1930s. Douglas Weir recounts the day in Trinidad when some unexpected convicts arrived on the shoreline. 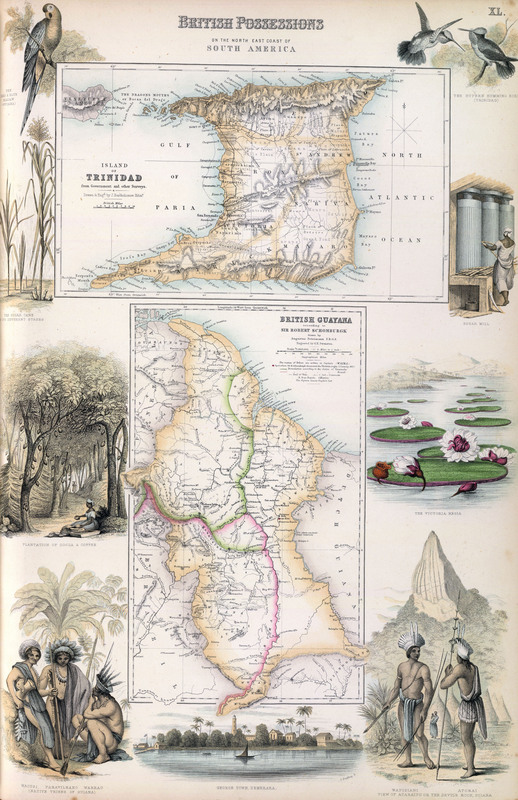 They were on the run from French Guiana where they had previously served time on the notorious Devil's Island. J.D. Hunter-Smith and three Colonial Agricultural Service colleagues found that they had to cross the Atlantic at the height of the Battle of the Atlantic in 1943 to make it to the Imperial College of Tropical Agriculture in Trinidad. Caroline Quarrier Spence examines the attempts to reform and modify slavery with particular reference to events in Trinidad. Trinidad in Transition: The Years after Slavery.